From left: Troy McDonald, Brook Hayes and Michael Hayes with the 97.8-pound kingfish caught off Fort Lauderdale. 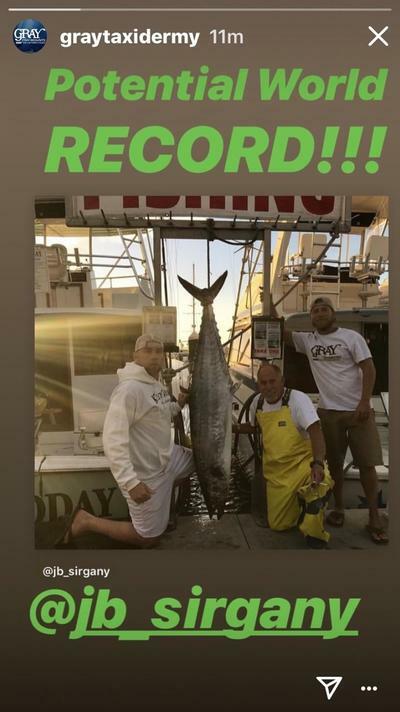 Newlywed Michael Hayes probably never imagined his name might soon be in the record books for one of the most highly sought after gamefish. Hayes and wife Brook were on their honeymoon and took a fishing trip with Capt. JB Sirgany of Topshot Sportfishing aboard the Happy Day Today last week. While fishing less than a mile off the beach of Fort Lauderdale in 70 feet of water, something made a meal of the small bonita they were trolling. “It crashed the bait and looked like a tarpon,” said Sirgany, who’s been fishing the area for about 50 years. Hayes grabbed the rod and watched as line peeled off at an alarming rate.